﻿ Kubu Carik Bungalows, Bali | FROM $21 - SAVE ON AGODA! Have a question for Kubu Carik Bungalows? "The staff is friendly and accomodating." "I had a wonderful stay." "Owner was cooking delicious food and extremely helpful with everything ." 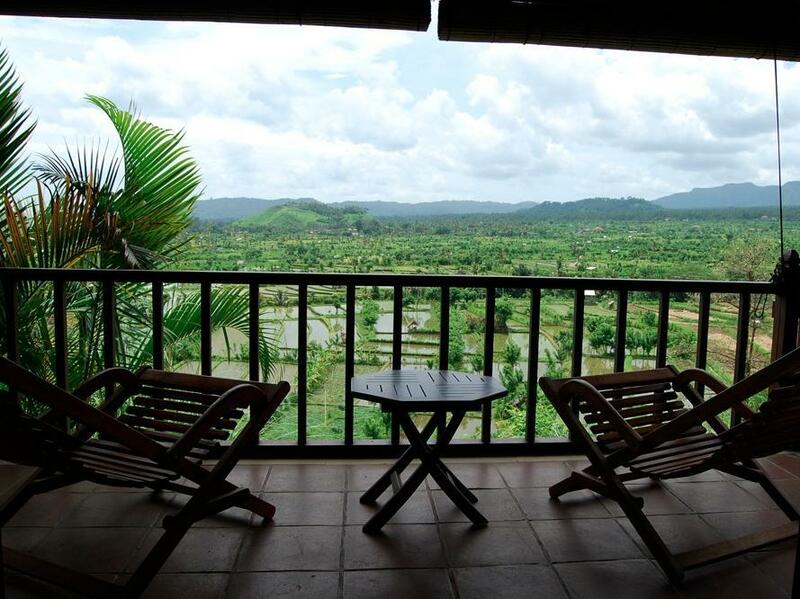 "Overlooking the rice fields , stunning place with the pool ." 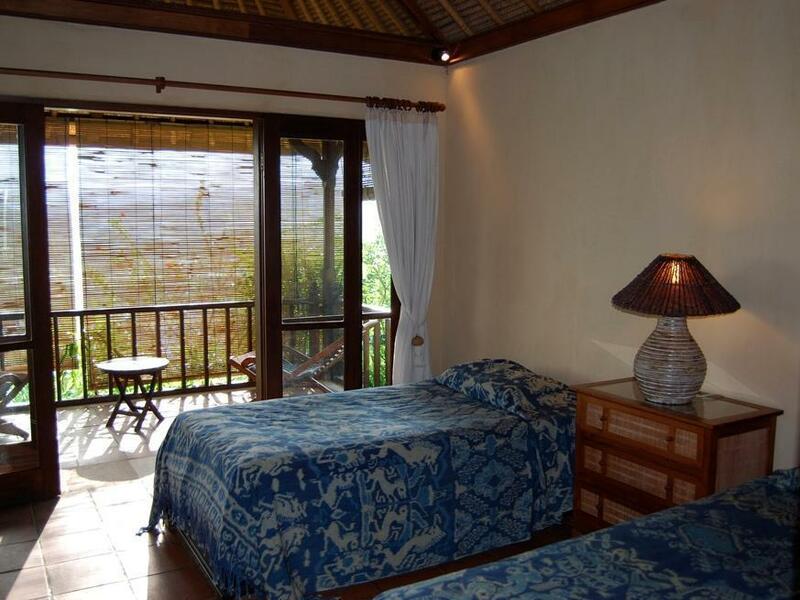 Nestled in the heart of Candidasa, Kubu Carik Bungalows is an ideal spot from which to discover Bali. The hotel lies 10 Km from the city center and provides accessibility to important town facilities. Visitors to the hotel can take pleasure in touring the city's top attractions: Taman Tirta Gangga, Rumah Sakit Hindhu Dharma Yadnya, Ujung Water Palace. 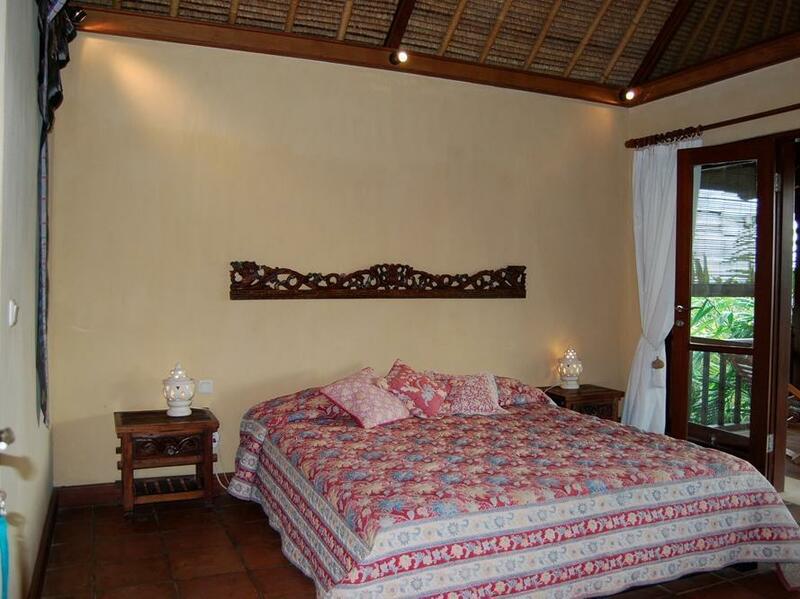 The facilities and services provided by Kubu Carik Bungalows ensure a pleasant stay for guests. While lodging at this wonderful property, guests can enjoy free Wi-Fi in all rooms, Wi-Fi in public areas, car park, room service, airport transfer. 2 rooms spread over floors provide a warm and pleasant home away from home. Modern comforts such as non smoking rooms, air conditioning, desk, balcony/terrace, shower can be found in selected rooms. The hotel's recreational facilities, which include outdoor pool, diving, fishing, massage, garden are designed for escape and relaxation. Superb facilities and an excellent location make the Kubu Carik Bungalows the perfect base from which to enjoy your stay in Bali. "Great and tranquil surroundings, generous and very tasty bre..."
Great and tranquil surroundings, generous and very tasty breakfast, Kadek was very nice and helped our every need. Would definitely recommend to anyone trying to escape from stress of everyday life. The room is lovely. The view is outstanding. The staff is friendly and accomodating. I had a wonderful stay. Very i spiring location. The staff were incredibly rude. Also, there are three threatening feral dogs prowling around and I didn't feel safe. This was all bad enough but after leaving I noticed that $200 US were missing from my bag and I am pursuing action against the establishment with Agoda. I strongly recommend that you not stay here. I was looking for a quiet and beautiful place to relax . So happy I found it ! This villa is a true paradise! Overlooking the rice fields , stunning place with the pool . Owner was cooking delicious food and extremely helpful with everything . Location is close to few most beautiful temples and about 30 min of driving to the beach . Best place I've stayed in east Bali ! If you want peaceful, quiet, nature, an amazing view from your balcony, the best Balinese food ever& kind, caring people and join the Balinese relaxed pace then this is your paradise. The owners go out if their way to make you feel at home. The two bungalows themselves are beautiful & clean with Lempuyan temple and Titra Ganga close. I can wholeheartedly recommend doing a cooking course with cook and co-owner Cadek. He knows it's stuff and creates magic in the kitchen. I loved it and to me their place was the best I stayed at at Bali! Actually I seldom leave reviews, but this time I have to say something. The bungalows are built on a hillside full of greeneries between village and fields so they are not easy to find, but when laying down on balcony chairs or by the swimming pool, seeing the beautiful country views down there, all this long journey become worthwhile. We booked only one night and decided to stay another day once we arrive. The food there are also impressive as they have a good local cook, you can have meals with the hospitable hosts, Otto and Rosemarie, they will tell you many stories about Bali, Indonesia and themselves as well. We have a very enjoyable 2-days stay with them. I will surely go back there next time in Bali and I will recommend to my friends. We spent two nights in October 2015 at this scenic tranquil somewhat out of the way place & wished it had been more. The A/C worked well, the view from our room was magnificent, and the pool was wonderful. Without a car, we couldn't venture far, apart from a walk through the rice fields. There's no restaurant or shop nearby but no need....there was delicious Indonesian food cooked by Kadek & staff. They kindly took time cooking a huge rijstaffel for one so I could experience this. There was bacon & eggs, but the highlight was one of the 6 lovely spreads served at breakfast with toast: lime curd/butter spread...which I couldn't resist eating by the spoonful! For entertainment we played with the 3 friendly dogs, watched the village life below, & read. The stay recharged our batteries as we slept peacefully there. This isn't a place for nightlife or shopping, but for those looking for peace & tranquillity. Great place for singles or couples but ideal for 2 couples or friends as there's two rooms sharing a common sitting/ dining area. It would be even better with your own vehicle. Definitely a place I'd like to return to. We spent 2 days down there, out of space and time, enjoying the scenery, walking in rice-fields and villages. Our hosts drove us to Amlapura water-palace (amazing beauty) and Ahmed beaches. Warm moments over evening family dinners, sharing good stories with our hosts. A must-go place! The owner is extremely friendly, felt like being a family. It is very quite place, the room is comfortable with good views. the kubu carik is like the name says really a villa in the middle of bali's rice fields. we spend there two wonderful nights and enjoyed pure nature and delicious food. we all 4 recommend this piece of paradise to everyone who wants to experience the non touristic world of bali. the pool offers a fantastic view over the rice fields and is perfect for a relaxing cool down. i normally avoid the usual 5 star establishments. Most are expensive and they all look the same, feel the same, and come with no surprises. Kubu Carik on the other hand, is my latest 'Great Find'. Nestled in some remote area near the Tirtagangga Water Palace in the Karangesem area of eastern Bali, Kubu Carik is adventure, charm and magic in abundance! Glorious, glorious location, perched on the hills overlooking a vast plain of padi fields and villages, well appointed rooms configured in typical Balinese layout, charming staff, great food... but what really sets the Kubu Carik experience apart are the owners, the Ionker family. We had the company of the family patriach, Mr Ionker, for dinner, and what an evening it was! A Dutch descendant who lived the best part of his life in Asia, there was not a dull moment with Mr Ionker! Absolute magic, thank you Kubu Carik!! We had two wonderfull nights there. Everything is great except the three dogs. They are not really well trained. The foods and staff is really good and nice at the same time. we arrived from lovina and got dropped at tirta gangga tourist center,, we called the staff because we didn't come with car.. they arranged a transportation for us,, you might wanna tell them in advance if you need to be picked up,, they can pick you up anywhere in bali,,, but of course you'll have to pay.. we got there,, and they showed us our room,, it has a really beautifull view overlooking paddy fields.. the foods was really great,, it's a perfect place for those who wanted to spend times far away from crowds and noises,, it was relaxing and you can rent a motorcycle or car to explore north east of bali,, like amed, amlapura or tulamben,, it's not far at all... bottom line, i'm highly satisfied with the services and courtesy of the house and i would love to go back again..
Un coin de paradis au milieu de nulle part , la vue sur les rizières est fabuleuse, l'accueil est excellent et personnalisé. Les Temple et Palais de l'eau ainsi que Jemeluk (Amed) ne sont trop loin. Une expérience à vivre à Bali. Si l'on souhaite s'immerger dans le Bali local c'est l'endroit rêver. Un petit havre de paix ou l'on s'y sent bien. Les propriétaire sont d'une gentillesse et partage leurs savoir. Site remarquable, accueil merveilleux, ensemble élégant. Bungalows au toit de chaume, confortables et spacieux, avec un grand balcon donnant sur les rizières, le tout niché dans un jardin (avec piscine) agréablement intégré à une nature luxuriante. De nombreuses balades sont possibles à partir de là (Palais sur l'Eau de Tirtagangga, charmante cité d'Amlapura, etc). Accueil extraordinairement chaleureux, on s'attache à vous rendre le séjour agréable et à faciliter l'organisation de vos loisirs. Vous serez comblés: la nourriture y est délicieuse, et la conversation du maître de maison passionnante.